Jurassic World dinosaur made from foam for a photo-op at the licensing trade show! We created this large foam T-Rex prop as a photo op to tease the Jurassic World at NBCUniversal’s trade show booth at the Licensing Expo in Las Vegas. 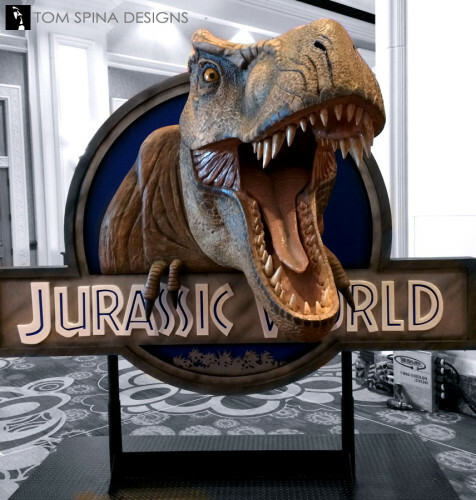 The Jurassic World dinosaur was mounted to a custom display made to look like the logo from the movie’s teaser posters. 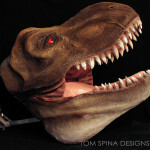 Foam sculptor Richard Riley carved the life size Tyrannosaurus Rex head statue by hand from EPS foam. He sculpted and molded various sized teeth, then cast those razor sharp (looking!) dinosaur fangs in lightweight resin. 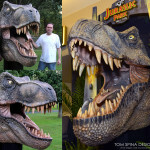 He painted the entire foam prop bust to create a realistic dinosaur skin color and weathered the teeth with stains and muck, since we all know that T-Rexes (whether they are alive or statues) are terrible when it comes to flossing. And, of course, Rich made the dinosaur prop’s foam claws which clutch at the Jurassic World logo. 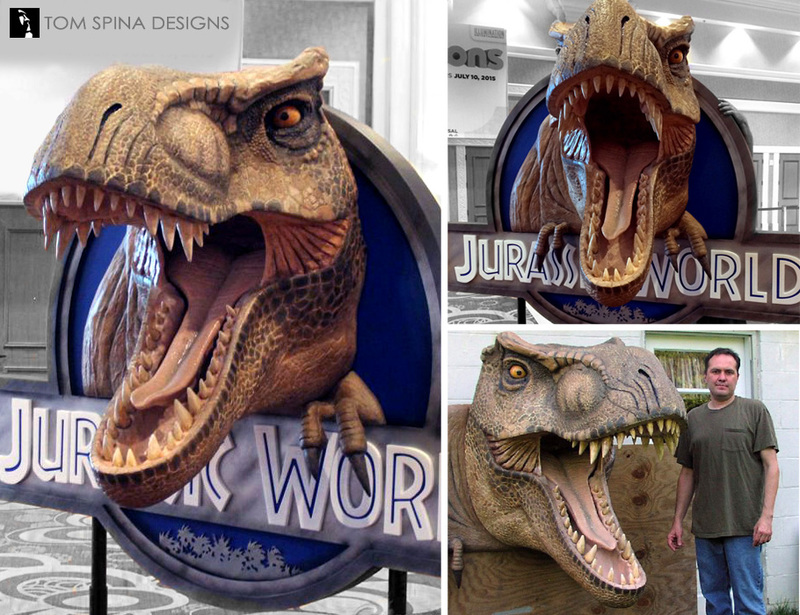 We teamed with our talented friends at Creative Model Shop, whose artists fabricated the 9′ long logo which supports our dinosaur bust. 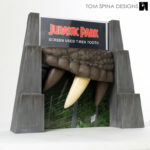 The movie logo was made from layers of custom cut MDF and plywood and fit over a heavy custom welded stand with textured metal base. 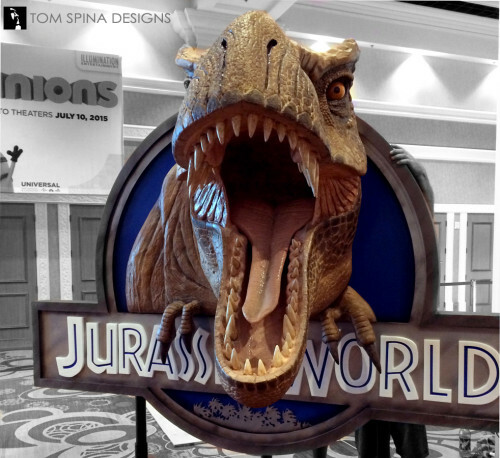 It was a ton of fun creating a life-sized, movie prop style Jurassic World dinosaur bust for this trade show, and creating it in foam rather than having to sculpt the beast in clay and mold it kept the budget in check for our client. 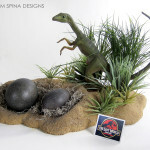 We can make just about anything as a foam prop, so let us build something amazing for your next event, exhibit or party! 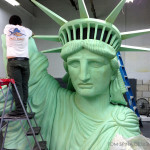 Looking for a show stopping foam prop or character for your next trade show?